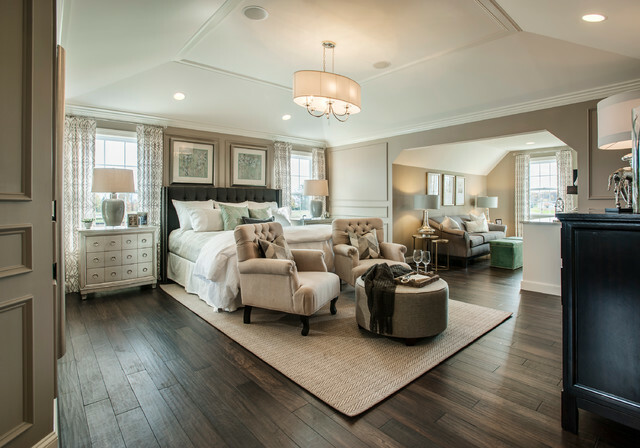 Vistas at Highland Ridge - Single-Family Homes in Telford, PA - Transitional - Bedroom - Philadelphia - by W.B. Homes, Inc. Please where can I find these nightstands? Hi! The wall color in this beautiful owner's suite is Sherwin Williams Mega Greige (flat) - SW7031! Flooring - What is the brand name of the flooring use? This beautiful floor is Mannington Mayan Pecan. The color is Pepper and was installed for us by Roy Lomas Carpets from Harleysville, PA! Paint color - What paint color did you use? Is the bedroom the same color as the kitchen wall. Hello! Where is this rug from please? I've been looking for a bedroom rug for awhile & love it! Thanks! This is one of our favorites as well! This area rug was made for us by our flooring contractor, Roy Lomas! The manufacturer is Tuftex and the style and color are Only Natural Silverado! Hi, Carolyn! These chairs were provided to us by the model home design team, so we don't have the exact details. Where did you get the artwork over the bed? Who is the artist? Hi, Leslie! We're glad you like it! However, the art in our Covington Model Home was provided by the decorating team, so we don't have the exact details. Can you put me in contact with the decorating team? Curtains - Where can I find these curtains? These beautiful curtains were custom made by our decorator! rug - approximately what size rug is that under the bed? Where can I buy this rug? Floor - Love the flooring... Could you let me know the make and color? Hand Scraped, Prefinished, and 4 side beveled. Not sure the stain color. Would love to know the wall colors as well in this room. Flooring? - can you tell me what the make and and style of flooring is? The flooring in this dreamy owner's bedroom is Mannington "Exotics" Mayan Pecan in Pepper! What are the paint colors please? Hi, Donna! The wall color in this cozy owner's suite is Sherwin Williams Mega Greige (flat), #SW7031 and all accenting trimwork is Sherwin Williams Creamy (flat), #SW7012. Ceiling colors throughout are Sherwin Williams Quietude (flat) #SW6212. Question on Paint Colors - On two different computers, I am getting 2 different color palates for this room. What color of paint was used where? The walls? The ceiling? And, if there were more than one "beige" used. This would be very helpful. Thank you. Love this look! Good morning, Teresa! We're glad you're loving this cozy owner's suite! The wall color of both the bedroom and owner's retreat is Sherwin Williams Mega Greige (flat), #SW7031 and all accenting trimwork is Sherwin Williams Creamy (flat), #SW7012. Ceiling colors throughout are Sherwin Williams Quietude (flat) #SW6212. Hope this helps! Hi, can you tell me the manufacturer of the night stands? - I like the silver finish and drawer detail. Hi, Terri! Unfortunately, these nightstands were provided by the model design team, so we don't have the exact manufacturer details. Flooring - What is the name of this wood floor? Love it! We're glad you like it! The flooring in this dreamy owner's bedroom is Mannington "Exotics" Mayan Pecan in Pepper! Night stands - Do you have any information on who makes the bed or night stands? Hi, April. Unfortunately, the night stands and bed were provided by the design team, so we don't have the exact details. Who is the manufacturer of the drapery fabric? Hi, Gail. The window treatments in this owner's suite were custom ordered by the designers, so unfortunately we don't have the exact details. Size of Room - I would really love to know the size of this room! It is so perfect! Thank you! Hi, Brea! We're glad you like it! The owner's suite in our Covington model home is 18' x 15'9" in the area with the vaulted ceiling. The adjacent owner's retreat is 13' x 9'4". what kind of flooring is this and where can it be bought? Hi, Debbie! The flooring in our beautiful owner's suite at Highland Ridge is from Mannington, their Exotics Mayan Pecan in Pepper! Our flooring was provided by our partners at Roy Lomas Carpets and Hardwoods, located in Harleysville, PA! paint color on the walls please? Ceiling Light - Where can I purchase the ceiling light. Hi! This fixture is from Progress Lighting, #P4431-104 in Polished Nickel! Where can I find the nightstands? - Nightstands please? We like these, too! Unfortunately, they were provided by our wonderful design team so we do not have the product details. Hi there! Unfortunately, we don't have an answer for you. This beautiful bed was provided by our design team. Drapery - Where can I get those drapery? Love it! We agree - they are perfect! They were custom made by our decorator for this home. Dresser - Hi can you please provide the information for the dresser and the dimensions, thank you. Nightstands - Do you know where these bedside chests/nightstands were purchased? Thank you! Chandelier - The chandelier is a Ren-Wil LPC077 . I have one. Chandelier - Where can I find he chandelier? What is the brand? Wondering where chairs and the rug are from? Love the nightstand/dresser - Would you please let me know where the night stands are from? Thank you!! Drapery - Where can I buy drapery like this? It is very pretty. Thanks! Love chandelier! - Where did you purchase? Room size? - What are the room dimensions? Love the chairs! Chairs - Can you tell me where the chairs are from? Thanks! chest/nightstand - Where can I find the white chest? 8. Attic makeover. While this Pennsylvania third-floor master suite was part of a newly constructed home, it does provide some great inspiration for homes with underutilized attics. The sloped ceiling follows the contours of the roofline, adding visual interest and a sense of shelter. The adjacent seating area is also a delightful perk. Coziness of the bed and I like the rug. I don’t like chairs at the foot of the bed.